The Rumanian and Russo-Jewish Committees. An organization formed by Jews of the British empire having for its objects the promotion of social, moral, and intellectual progress among the Jews; and the obtaining of protection for those who may suffer in consequence of being Jews. Some far-seeing and large-minded men, among them the late Dr. Benisch and the Rev. Dr. A. Löwy (late secretary of the association), had many years before its establishment conceived the idea of forming a society on lines similar to those of the Alliance Israélite Universelle in Paris; but it was not until after the Franco-German war of 1870-71 that an opportunity presented itself for the realization of their idea. Grave apprehensions were entertained that the work of the Alliance, interrupted by the war, would suffer through want of means; that the unhappy feud, which had estranged the two powerful nations of France and Germany, would, for some time to come at least, prevent the Jews in both countries from cooperating even in works of philanthropy, and that unless help came from without, disorganization, if not dissolution, must be the inevitable result. It was thought also that it was time a body so prosperous, influential, and sympathetic as the English Jews should take its stand by the side of the other sections of Jewry, and share in a movement full of promise for the welfare of the Jewish race; and at the same time should give the best conceivable evidence of their sympathy with their brethren in France. These were the objects which guided the promoters of the Anglo-Jewish Association; but taking into consideration the position occupied by Great Britain, it was from the outset thought desirable that the right of independent action should be reserved to the new society. While it works in the utmost harmony with the Alliance Israélite Universelle, this right has ever since been maintained. 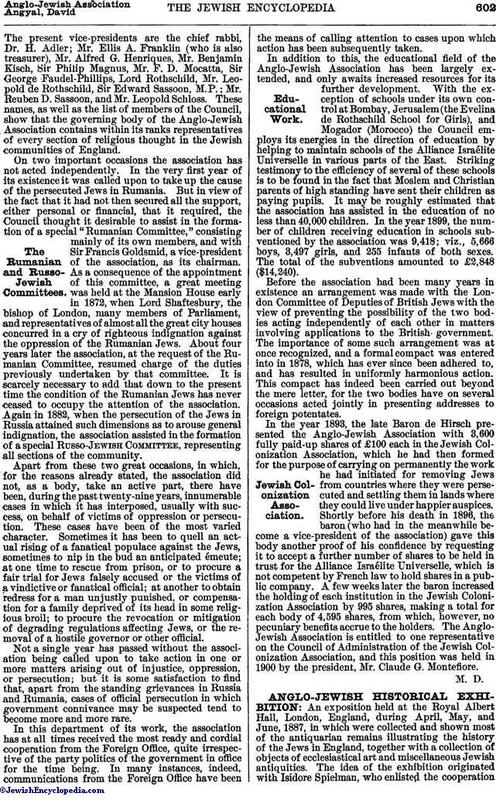 A large number of prominent members of the Jewish community in London gave their adhesion to the movement, and the Anglo-Jewish Association was formally constituted at a public meeting held on July 2, 1871. Efforts were made at once to obtain members throughout the United Kingdom and in the British colonies, and within the first year branches were formed in Manchester, Liverpool, and Birmingham, and promises of support were received from Cape Colony and some of the Australian colonies. 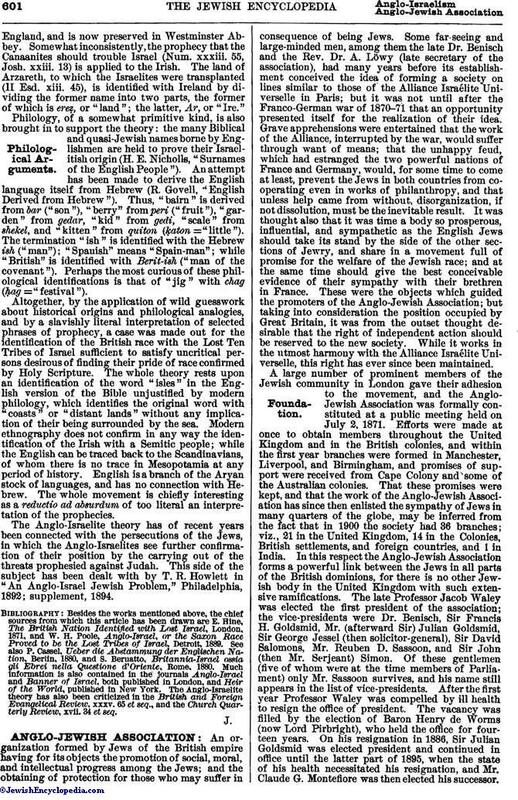 That these promises were kept, and that the work of the Anglo-Jewish Association has since then enlisted the sympathy of Jews in many quarters of the globe, may be inferred from the fact that in 1900 the society had 36 branches; viz., 21 in the United Kingdom, 14 in the Colonies, British settlements, and foreign countries, and 1 in India. In this respect the Anglo-Jewish Association forms a powerful link between the Jews in all parts of the British dominions, for there is no other Jewish body in the United Kingdom with such extensive ramifications. The late Professor Jacob Waley was elected the first president of the association; the vice-presidents were Dr. Benisch, Sir Francis H. Goldsmid, Mr. (afterward Sir) Julian Goldsmid, Sir George Jessel (then solicitor-general), Sir David Salomons, Mr. Reuben D. Sassoon, and Sir John (then Mr. Serjeant) Simon. Of these gentlemen (five of whom were at the time members of Parliament) only Mr. Sassoon survives, and his name still appears in the list of vice-presidents. After the first year Professor Waley was compelled by ill health to resign the office of president. The vacancy was filled by the election of Baron Henry de Worms (now Lord Pirbright), who held the office for fourteen years. On his resignation in 1886, Sir Julian Goldsmid was elected president and continued in office until the latter part of 1895, when the state of his health necessitated his resignation, and Mr. Claude G. Montefiore was then elected his successor.The present vice-presidents are the chief rabbi, Dr. H. Adler; Mr. Ellis A. Franklin (who is also treasurer), Mr. Alfred G. Henriques, Mr. Benjamin Kisch, Sir Philip Magnus, Mr. F. D. Mocatta, Sir George Faudel-Phillips, Lord Rothschild, Mr. Leopold de Rothschild, Sir Edward Sassoon, M. P.; Mr. Reuben D. Sassoon, and Mr. Leopold Schloss. These names, as well as the list of members of the Council, show that the governing body of the Anglo-Jewish Association contains within its ranks representatives of every section of religious thought in the Jewish communities of England. On two important occasions the association has not acted independently. In the very first year of its existence it was called upon to take up the cause of the persecuted Jews in Rumania. But in view of the fact that it had not then secured all the support, either personal or financial, that it required, the Council thought it desirable to assist in the formation of a special "Rumanian Committee," consisting mainly of its own members, and with Sir Francis Goldsmid, a vice-president of the association, as its chairman. As a consequence of the appointment of this committee, a great meeting was held at the Mansion House early in 1872, when Lord Shaftesbury, the bishop of London, many members of Parliament, and representatives of almost all the great city houses concurred in a cry of righteous indignation against the oppression of the Rumanian Jews. About four years later the association, at the request of the Rumanian Committee, resumed charge of the duties previously undertaken by that committee. It is scarcely necessary to add that down to the present time the condition of the Rumanian Jews has never ceased to occupy the attention of the association. Again in 1882, when the persecution of the Jews in Russia attained such dimensions as to arouse general indignation, the association assisted in the formation of a special Russo-Jewish Committee, representing all sections of the community. Apart from these two great occasions, in which, for the reasons already stated, the association did not, as a body, take an active part, there have been, during the past twenty-nine years, innumerable cases in which it has interposed, usually with success, on behalf of victims of oppression or persecution. These cases have been of the most varied character. Sometimes it has been to quell an actual rising of a fanatical populace against the Jews, sometimes to nip in the bud an anticipated émeute; at one time to rescue from prison, or to procure a fair trial for Jews falsely accused or the victims of a vindictive or fanatical official; at another to obtain redress for a man unjustly punished, or compensation for a family deprived of its head in some religious broil; to procure the revocation or mitigation of degrading regulations affecting Jews, or the removal of a hostile governor or other official. Not a single year has passed without the association being called upon to take action in one or more matters arising out of injustice, oppression, or persecution; but it is some satisfaction to find that, apart from the standing grievances in Russia and Rumania, cases of official persecution in which government connivance may be suspected tend to become more and more rare. In this department of its work, the association has at all times received the most ready and cordial cooperation from the Foreign Office, quite irrespective of the party politics of the government in office for the time being. In many instances, indeed, communications from the Foreign Office have been the means of calling attention to cases upon which action has been subsequently taken. In addition to this, the educational field of the Anglo-Jewish Association has been largely extended, and only awaits increased resources for its further development. With the exception of schools under its own control at Bombay, Jerusalem (the Evelina de Rothschild School for Girls), and Mogador (Morocco) the Council employs its energies in the direction of education by helping to maintain schools of the Alliance Israélite Universelle in various parts of the East. Striking testimony to the efficiency of several of these schools is to be found in the fact that Moslem and Christian parents of high standing have sent their children as paying pupils. It may be roughly estimated that the association has assisted in the education of no less than 40,000 children. In the year 1899, the number of children receiving education in schools subventioned by the association was 9,418; viz., 5,666 boys, 3,497 girls, and 255 infants of both sexes. The total of the subventions amounted to £2,848 ($14,240). Before the association had been many years in existence an arrangement was made with the London Committee of Deputies of British Jews with the view of preventing the possibility of the two bodies acting independently of each other in matters involving applications to the British government. The importance of some such arrangement was at once recognized, and a formal compact was entered into in 1878, which has ever since been adhered to, and has resulted in uniformly harmonious action. This compact has indeed been carried out beyond the mere letter, for the two bodies have on several occasions acted jointly in presenting addresses to foreign potentates. In the year 1893, the late Baron de Hirsch presented the Anglo-Jewish Association with 3,600 fully paid-up shares of £100 each in the Jewish Colonization Association, which he had then formed for the purpose of carrying on permanently the work he had initiated for removing Jews from countries where they were persecuted and settling them in lands where they could live under happier auspices. Shortly before his death in 1896, the baron (who had in the meanwhile become a vice-president of the association) gave this body another proof of his confidence by requesting it to accept a further number of shares to be held in trust for the Alliance Israélite Universelle, which is not competent by French law to hold shares in a public company. A few weeks later the baron increased the holding of each institution in the Jewish Colonization Association by 995 shares, making a total for each body of 4,595 shares, from which, however, no pecuniary benefits accrue to the holders. The Anglo-Jewish Association is entitled to one representative on the Council of Administration of the Jewish Colonization Association, and this position was held in 1900 by the president, Mr. Claude G. Montefiore.